It’s rare these days when I get a game right as it releases (or at least this close to release). I suppose it should be noted that I didn’t actually purchase this one though, instead it was gifted to me by my father. He was congratulating me on my new job, which *side note* I’m starting tomorrow with an orientation at 8 am. So first of all, thanks Dad! Wargroove is a game that I didn’t see coming. I happened upon it in the Steam discovery queue, and it was reminiscent of many old-school turn-based RPGs from years past. I added it to my wishlist and that was going to be that until later on when I had disposable income to check it out. Looking it over, I was instantly reminded of the Shining Force series, but most reviewers of the game hearkened it to Advance Wars — a series I’m familiar with but never played. There’s also elements that feel familiar to Langrisser (Warsong) of which I covered recently. Wargroove is a top-down tactical RPG created in-house by Chucklefish Games, whom you might know as the creators of Starbound, and also the publisher of Stardew Valley and a cool rogue-lite I played years ago called Risk of Rain. The one similarity all of these games have is a pixel-art graphic style, but that’s where the sameness ends. The game opens with a short tutorial that explains a bit of what’s going on under the hood, along with a prelude to the storyline. You’ll start off as one of the evil characters heading to take care of the king of this land. Story bits happen in cut scenes that are layered over the top of the gameplay map, as is combat, done in an animation style that I adore. Your unit(s) will appear on one side of the screen, with enemy unit(s) on the other, and your unit(s) will cross over the middle border to attack and vice versa. A single unit on the map can represent multiple units though, which is mostly conveyed through their health bar. You can get an over view of the map to make strategic decisions, and also click on units or the map terrain itself for more information. There seems to be a bunch of complexity here but it’s really rather simple. Some units do better against others, and weak to others still. Some terrain will benefit you, and some will slow you down along with lowering your defenses. Later missions introduce buildings that you can capture by first lowering their health to zero and then using the appropriate unit to claim them. You’ll also eventually get barracks and other buildings that allow you to purchase units once per turn. The story continues, and with your father being dead, you (the princess — now queen) must lead your people against the oncoming evil. Sounds pretty similar to most fantasy tales, no? You will end up being able to control other heroes, and your heroes themselves have what they call a “groove” which is essentially a hero power that can turn the tide of battle. Our queen can heal units in a small area. Another hero of this faction can lay down a stone that grants units within a small area a defensive boost. It’s all pretty straightforward when you get used to it. Outside of the main campaign, there are a few other things you can do. There is a multiplayer option where you can play against friends. You can play Arcade, which essentially is a death match on a map with plentiful resources and you’ll progress through various bosses to complete it. There is also a map/campaign maker, and it’s fairly easy to use. I threw together the above map in under 5 minutes with minimal effort, and it appears that you could create some cool stuff if you wanted to go down that route. This gives the game near infinite replay-ability. There is also a puzzle mode that I have yet to unlock, but I’ve only played the game for a handful of hours. I don’t remember where I first saw Chasm. I just know that when I saw it, I wanted to play it and its been on my wishlist ever since. I’d kind of forgotten about it, to be honest, because when I saw that it released the other day, I was surprised to find that it had been on my wishlist since 2016! Apparently this was a crowdfunded title and there were some development hiccups along the way, but it has officially released on PC and Console, and being a Metroidvania my preferred version was on the PS4. I downloaded it on release day and got to playing it shortly thereafter. For the uninitiated, a “Metroidvania” is a particular style of game. It’s one part side-scrolling platformer and one part gated exploration. For instance, on a given level, you’ll come across places that should be accessible but are not due to lack of a particular skill. You’ll find a small crack in the ground and later get a ground pound ability to get through it, or will find a way to shrink to fit under low hanging boundaries. This type of game’s namesakes are Metroid and Castlevania, two pioneering titles of the genre. Chasm has these same sorts of mechanics, but have added some RPG elements along with a touch of procedural generation. 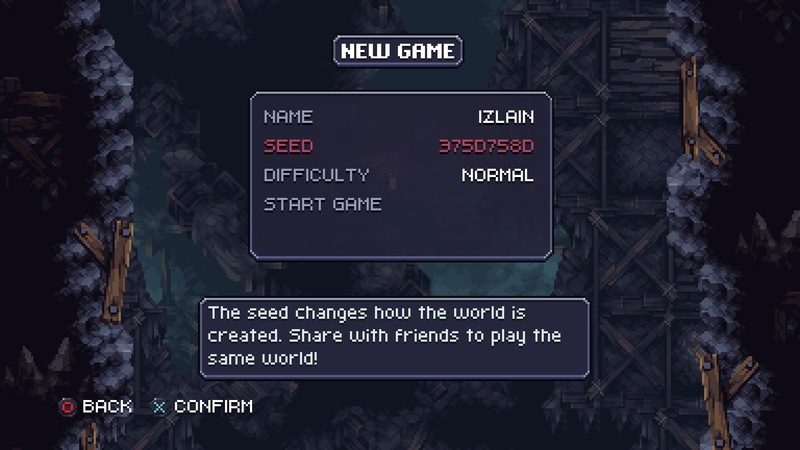 As such, when you start a new game it will be a particular seed, and you could give this seed name out to share the same world with someone else. Our story opens with an introduction to the protaganist (named by you), who is a recruit for some army or another. Your first task is to head to the town of Karthas and find out what is going on with the mines there. After a long journey (on foot) you arrive and it appears to be a ghost town. After inspecting the buildings, you’ll run into the mine’s foreman who is holed up in his office. He tells you that the miners dug a bit too deep and that something terrible happened and now they are all trapped down there. You’ll head into the mines with little more than a sword and some quilted armor. From there it’s hack and slash time, with platforming jumpy bits in between. The map will open up as you progress, and soon you’ll find some of the townsfolk trapped in cages. Release them and they will return to town, and new options will open up for you. One of the townsfolk is a merchant that you can buy from and sell to. Another opens up new areas in the mine, while the last one I found took up residence in the tavern, and has a gambling game you can play. I have no idea what sorts of prizes you might win, I lost the only coin I had to the machine. The menu system is pretty straight forward. You’ll find your typical RPG character sheet with stats, an equipment menu to gear up on, and your item inventory screen with descriptions of things you’re picking up. Food items will restore health in a pinch, and some valuables appear to be used in crafting though I guess I haven’t rescued the appropriate NPC just yet. There is also a bestiary tab with stats and info on monsters you fight, with each individual monster requiring a set amount of kills before you open their page. I’ve faced off against a couple of different bosses so far, and they weren’t too difficult once you figured out their play pattern. As I mentioned earlier, these style of games tend to have a gating system that requires you to find particular equipment or skills to progress past certain points, and so far the only item I’ve found are the Spiked Gloves. These allow you to grab onto ledges and traverse areas you couldn’t reach before. Still haven’t found a way to shrink or slide/roll to get through small spaces, but I have found those areas on the map. The only way to save your game is to come across these altars (one is also present up in Karthas) which means you’ll have to be careful in between saves. I’ve had a few deaths and though you don’t really lose anything XP or gear wise, you do lose any progress since your last save. Hoarding HP items is probably the best advice I can give, but once you learn the play patterns of enemies it becomes fairly easy to avoid death. I’ve delved fairly deep to this point, down to the third level of the mine which has stopped looking like a mine and more like some ancient temple. I imagine there will be different biomes as I persist, but to this point it has been slowly ramping up in difficulty and I can’t complain. Chasm was listed for $20 but was on sale for $17.99 during the first week. I’d recommend it if you enjoy this style of game and are looking for something new. The random element might make it worth several playthroughs, I’ll let you know if that’s the case once I’ve completed it for the first time.